What's included in your Mauritius holiday package to Dinarobin Beachcomber Golf Resort & Spa? What makes the accommodation at this hotel so special is that it is exclusively suites: Junior Suites, Club Junior Suites, Club Junior Beachfront Suites and Club Senior Beachfront Suites. 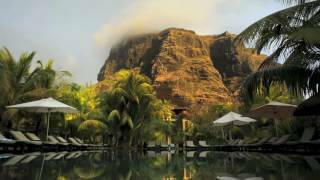 Dinarobin’s location is among the most stunning in Mauritius, (at the foot of Le Morne Mountain) which makes this hotel that much more desired by discerning guests. View the exquisite ocean views from Dinarobin’s characteristically deep verandahs, giving each suite the feeling of a private seaside home. The public areas consist of vast spaces under rustic thatch canopies. Reflecting ponds have transformed the main restaurant into a fairyland of twinkling lights where tables are set on islets. A path leads to a second restaurant where gourmet dishes never fail to delight guests. If you’re in the mood for Italian fare, genuine Tuscan delights await you at the third restaurant. Lunch is served right on the beach, so you don’t have to miss one moment on the velvet sand to enjoy your meals. A brand new concept at Dinarobin is available, whereby adults who seek an especially tranquil and refined environment now have the opportunity to reserve Club Suite accommodation in the ‘adult’s crescent’. Certain perks and facilities are available to residents of the adult’s crescent, in addition to the pool in Crescent six being reserved for guests residing in this crescent as well as an adult’s only alfresco beach bar, adjacent to this crescent. A dedicated concierge service is available to Club members and a personalised check-in facility on arrival. Dinarobin's Kids Club has a unique tropical feel and charm. Reserved for children aged 3 to 12, it is housed in a charming thatch-roofed pavilion. Set beneath a large spreading badamier tree, it is built to resemble a traditional Mauritian bungalow with its lovely wooden deck that connects the indoor and outdoor play areas. Individually controlled air-conditioning, private bathroom with bathtub, shower and separate W.C, dressing area, hairdryer, minibar, complimentary tea & coffee facilities, safe, ironing board and iron, international direct dialling telephone and television with satellite channels. Non-Smoking Policy: All rooms, restaurants, bars and public areas of the hotel are non-smoking areas. Suites are located on the 50 acres of tropical gardens. Large bedroom with seating area. Sumptuous bathroom with corner bath, shower and dressing area. Furnished outdoor terrace or balcony. Golf Suites are the same category as the Junior Suites with a number of superb golfing extras. Free Green Fees and Golf Carts daily on Paradis Golf Course. As from 6 days stay, adult guests will be entitled to one free Golf experience outside Paradis (including green fees and golf cart and return transport) at one of the following Golf Courses: Tamarina, Bel Ombre or Avalon. For every additional 2 nights, guests will be entitled to another free golf experience outside Paradis Golf Course. Golf extras are offered to adults only staying in these suites. Club Junior suites have access to the club at Dinarobin. Large bedroom with seating area. Sumptuous bathroom with corner bath, shower and dressing area. Furnished outdoor terrace or balcony. Suites are located close to the beach and include membership of the club at Dinarobin. Large bedroom with seating area. Sumptuous bathroom with corner bath, shower and dressing area. Furnished outdoor terrace or balcony. The ultimate in luxury accommodation. Separate lounge and indoor dining area. Very spacious bathroom with large shower and dressing room. Spacious outdoor terrace or balcony ideal for al fresco dining. Access to The Club at Dinarobin. The family suites have two large bedrooms, one caringly tailored to children. Open plan seating area. One bedroom designed for children. The children's room has twin beds and removable wooden protection bars, fun duvets, pillows. Two en-suite bathrooms, one with mini-bathrobe and slippers, fun toilet seat, non-slip mats and step-up to the wash basin. Two outdoor terraces (terrace door from children's room can be locked). The ultimate in luxury family accommodation, with a prime spot close to the beach and membership to the club at Dinarobin. Open plan seating area. One bedroom designed for children. The children's room has twin beds and removable wooden protection bars, fun duvets, pillows. Two en-suite bathrooms, one with mini-bathrobe and slippers, fun toilet seat, non-slip mats and step-up to the wash basin. Two outdoor terraces/balconies (terrace/balcony door from children's room can be locked). Luxury 4-bedroom villas which occupy the most stunning part of the peninsula. Facilities of the villa include heated private pool, private beach, private club car, private bicycles, fully equipped kitchen, elegant gazebo with furniture, dedicated valet service, access to the exclusive Club at Dinarobin, access to all the facilities at Dinarobin Hotel Golf & Spa and Paradis Hotel & Golf Club. Crescent 6 at Dinarobin has dedicated Zen Suites made up of 24 Zen Suites (Club Junior Suite), 4 Beachfront Zen Suites (Beachfront Club Junior Suite) and 6 Senior Zen Suites (Beachfront Club Senior Suite). Benefits of the Zen Suites include adults only Crescent 6, access to The Club at Dinarobin, Pool Service, Zen beach area with dedicated beach kiosk and sun loungers, WiFi on the beach, beach concierge. As Dinarobin’s main buffet restaurant, its name perfectly describes its relaxed and romantic atmosphere. Generous buffet dinners are automatically included in the half board meal package; some evenings see a Chef’s menu is offered. Divided into three areas, the layout has been designed to give a genuine feeling of intimacy with tables well spaced for privacy. The restaurant overlooks the pool and the glorious sea beyond. This popular bar is the centre of conviviality and entertainment at Dinarobin. Elegantly furnished for total relaxation, Mahogany Bar is sophisticated and elegant while still exuding a laid-back atmosphere. Beach Lounge is an exclusive seaside relaxation area for guests who seek the perfect location for lounging in the sun while enjoying mood-setting background music and on-the-spot service. The Kabanon Beach Lounge area is open from 10h30 until 18h30 daily, weather permitting. A specially designed alfresco lunchtime menu tantalises appetites around noon while Champagne Hour early evening will set the mood for toasting another perfect Dinarobin sunset. Is a gastronomic restaurant specialising in fine Mauritian fare, and is known as one of the best restaurants on the island. The cuisine is based on the original concepts of a Michelin-accredited chef and is prepared with local ingredients to add to its uniquely Mauritian flavour. The menu offers an array of dishes both included in the half board package or at a nominal supplement. The restaurant shares an expansive view over the pool with L'Harmonie and seats a maximum of 45 guests for dinner. Children older than 11 years are welcome. Il Gusto is the perfect dining spot for the lovers of authentic Italian food, where the flavours of Tuscany will enliven your palate. The décor of the restaurant reflects the warmth of Tuscan architecture and dinners here are included for half board guests. Enjoy a drink and a snack without having to change out of your beachwear. Situated right on the beach, this restaurant is also the place for sumptuous seafood barbecues and dinners on certain nights of the week. Opening for dinner is seasonal. Smart casual in the evenings. No shorts are permitted at the restaurants in the evenings. No sandals for gentlemen. Our dedicated leisure and entertainment team will ensure there are always fun, interesting activities at the hotel, in which guests are welcome to participate. A weekly entertainment programme is available to all residents. Daytime entertainment includes plenty of activities, which change according to a weekly programme. Evening entertainment is sophisticated and low key, in keeping with the ambience of the hotel. Water sports facilities are offered at Paradis so as to preserve the quiet and peaceful ambience along Dinarobin’s stretch of pristine beach. Specialised sports and lessons are available at Dinarobin. Dinarobin Beachcomber Golf Resort & Spa is known as the ultimate sanctuary for those looking to recharge their batteries. An evening match on one of the floodlit tennis courts, a beautiful nature walk along the pure white beach that stretches out over seven kilometres, or a game of volleyball... these are just some of the activities* on offer for those looking for active holidays. Golfers will enjoy a round or two of the legendary 18-hole Par 72 golf course at Paradis. To enhance this unique experience a complimentary Club car is delivered to their room a short time before tee-off. Access to three prestigious golf courses nearby also offers the opportunity to enjoy a game in different tropical settings. Sports enthusiasts will enjoy the new private coaching concept which is now available as a supplement to all guests of Dinarobin. For the more adventurous, the boathouse at the neighbouring Paradis Hotel and Golf Club offers a wide variety of water sports. * Enthusiasts and beginners will find whatever they are looking for with activities ranging from water skiing to snorkelling and sailing, to name just a few. All activities are supervised by experienced instructors. Guests at Dinarobin, Paradis and Trou aux Biches resorts have the option of pre-purchasing the Escape Package when travelling between 01 May - 08 October 2018. Available from the bar/s from 10h00 until 23h30, and at lunch and dinner. beer, bottled water, soft drinks, tea and coffee. Not available to clients booked in villa categories and not available at Dinarobin’s Butik Bar.